^ 1.0 1.1 1.2 1.3 1.4 Ashby, Michael F. and Jones, David R. H. Engineering Materials 2 with corrections. Oxford: Pergamon Press. 1992 . ISBN 0-08-032532-7. .
^ Smelting. Encyclopædia Britannica. 2007. 使用|accessdate=需要含有|url= (帮助). ^ 3.0 3.1 Alloying of Steels. Metallurgical Consultants. 2006-06-28 [2007-02-28]. （原始内容存档于2007-02-21）. .
^ Elert, Glenn. Density of Steel. [2009-04-23]. .
^ Smith & Hashemi 2006，第363页. ^ Smith & Hashemi 2006，第365–372页. ^ 8.0 8.1 Smith & Hashemi 2006，第373–378页. ^ Smith & Hashemi 2006，第388页. ^ Smith & Hashemi 2006，第249页. ^ Smith & Hashemi 2006，第361–362页. ^ Wagner, Donald B. 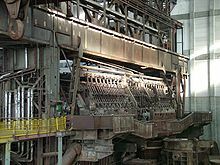 Early iron in China, Korea, and Japan. [2007-02-28]. （原始内容存档于2007-02-05）. ^ Ironware piece unearthed from Turkey found to be oldest steel. The Hindu (Chennai, India). 2009-03-26 [2009-03-27]. （原始内容存档于2009-03-29）. ^ Civilizations in Africa: The Iron Age South of the Sahara. Washington State University. [2007-08-14]. （原始内容存档于2007-06-19）. ^ Wagner, Donald B. Iron and Steel in Ancient China: Second Impression, With Corrections. Leiden: E.J. Brill. 1993: 243. ISBN 90-04-09632-9. ^ Needham, Joseph. Science and Civilization in China: Volume 4, Part 3, Civil Engineering and Nautics. Taipei: Caves Books, Ltd. 1986: 563. ^ Africa's Ancient Steelmakers. Time Magazine, Sept. 25, 1978. ^ Wilford, John Noble. 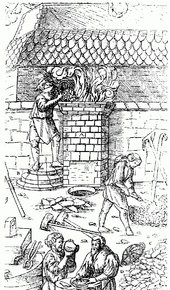 Ancient Smelter Used Wind To Make High-Grade Steel. The New York Times. 1996-02-06. ^ Ann Feuerbach, 'An investigation of the varied technology found in swords, sabres and blades from the Russian Northern Caucasus' IAMS 25 for 2005, pp. 27–43 (p. 29) 互联网档案馆的存檔，存档日期2011-04-30., apparently ultimately from the writings of Zosimos of Panopolis. ^ Needham, Volume 4, Part 1, p. 282. ^ 26.0 26.1 Juleff, G. An ancient wind powered iron smelting technology in Sri Lanka. Nature. 1996, 379 (3): 60–63. Bibcode:1996Natur.379...60J. doi:10.1038/379060a0. ^ Sanderson, Katharine. 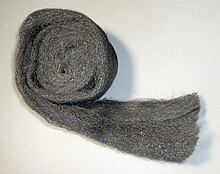 Sharpest cut from nanotube sword. News nature (Nature). 2006-11-15. doi:10.1038/news061113-11. ^ Wayman, M L and Juleff, G. Crucible Steelmaking in Sri Lanka. Historical Metallurgy. 1999, 33 (1): 26. ^ Hartwell, Robert. Markets, Technology and the Structure of Enterprise in the Development of the Eleventh Century Chinese Iron and Steel Industry. Journal of Economic History. 966, 26: 53–54. ^ 30.0 30.1 Tylecote, R. F. A history of metallurgy 2 edn, Institute of Materials, London 1992, pp. 95–99 and 102–105. ^ Barraclough, K. C. Steel before Bessemer: I Blister Steel: the birth of an industry (The Metals Society, London, 1984), pp. 48–52. ^ King, P. W. The Cartel in Oregrounds Iron: trading in the raw material for steel during the eighteenth century. Journal of Industrial History. 2003, 6 (1): 25–49. ^ K. C. Barraclough, Steel before Bessemer: II Crucible Steel: the growth of technology (The Metals Society, London, 1984). ^ Erickson, Charlotte. British industrialists: steel and hosiery 1850-1950. Cambridge University Press. 1986: 141–142 . ISBN 0-566-05141-9. 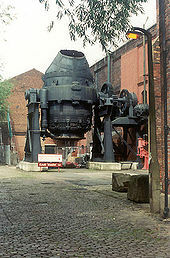 ^ Bessemer, Sir Henry. An Autobiography. London: Engineering. 1905: 176, 180. ^ Swank, James Moore. History of the Manufacture of Iron in All Ages. 1892. ISBN 0-8337-3463-6. ^ Jones, J.A.T. ; Bowman, B. and Lefrank, P.A. Electric Furnace Steelmaking, in The Making, Shaping and Treating of Steel, pp. 525–660. R.J. Fruehan, Editor. 1998, The AISE Steel Foundation: Pittsburgh. 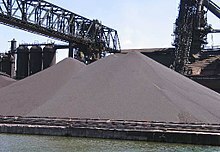 ^ Steel Industry. [2009-07-12]. （原始内容存档于2009-06-18）. ^ India's steel industry steps onto world stage. [2009-07-12]. 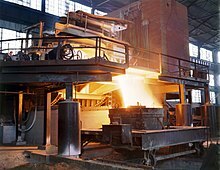 ^ Long-term planning needed to meet steel demand. The News. 2008-03-01 [2010-11-02]. （原始内容存档于2010-11-02）. ^ Uchitelle, Louis. Steel Industry, in Slump, Looks to Federal Stimulus. The New York Times. 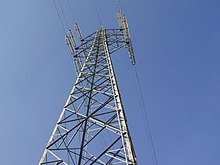 2009-01-01 [2009-07-19]. ^ High strength low alloy steels. Schoolscience.co.uk. [2007-08-14]. ^ Steel Glossary. American Iron and Steel Institute (AISI). [2006-07-30]. ^ Steel Interchange. American Institute of Steel Construction Inc. (AISC). [2007-02-28]. （原始内容存档于2007-12-22）. ^ Dual-phase steel. Intota Expert Knowledge Services. [2007-03-01]. ^ Werner, Ewald. Transformation Induced Plasticity in low alloyed TRIP-steels and microstructure response to a complex stress history. [2007-03-01]. （原始内容存档于2007-12-23）. ^ Properties of Maraging Steels. [2009-07-19]. （原始内容存档于2009-02-25）. ^ Bringas, John E. Handbook of Comparative World Steel Standards: Third Edition (PDF) 3rd. ASTM International. 2004: 14. ISBN 0-8031-3362-6. （原始内容 (PDF)存档于2007-01-27）. ^ Ochshorn, Jonathan. Steel in 20th Century Architecture. Encyclopedia of Twentieth Century Architecture. 2002-06-11 [2010-04-26]. Ashby, Michael F.; Jones, David Rayner Hunkin. An introduction to microstructures, processing and design. Butterworth-Heinemann. 1992. Bugayev, K.; Konovalov, Y.; Bychkov, Y.; Tretyakov, E.; Savin, Ivan V. Iron and Steel Production. The Minerva Group, Inc. 2001 [2009-07-19]. ISBN 978-0-89499-109-7. .
Degarmo, E. Paul; Black, J T.; Kohser, Ronald A. Materials and Processes in Manufacturing 9th. Wiley. 2003. ISBN 0-471-65653-4. Smith, William F.; Hashemi, Javad. Foundations of Materials Science and Engineering 4th. McGraw-Hill. 2006. ISBN 0-07-295358-6.